Shout out to those 1/1 Saprolings! 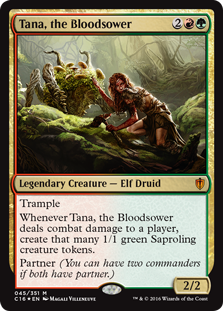 While Tana, the Bloodsower doesn’t have the same immediate impact on the board state as the ubiquitous Avenger of Zendikar, now all you belligerent botanists and red-loving hydroponics engineers can role play a commander that suits your interests. Tana has a few different moving parts, so let’s take each in turn. She has to do combat damage to a player. That’s the challenge. The reward for doing this is free 1/1 Saproling tokens. If Tana does more damage, you get more Saprolings. A cursory look at the other available partners may suggest Sidar Kondo of Jamuraa, since Tana has a power of two and Sidar Kondo’s ability would make her (and your 1/1 Saprolings) a bit less blockable. However, hitting an opponent for two damage and getting two Saproling tokens is ultimately non-threatening and unimpressive. What I really want is to make Tana something more like a 7/7 and get seven Saprolings. Then on my next turn I can drop a Coat of Arms and my Saprolings become large. Insert your favorite Overrun effect here. Maybe I could play a Craterhoof Behemoth and then, just to be cute, emerge that into a Decimator of the Provinces for one mana. Maybe you’re into Triumph of the Hordes. Anyway, getting only two Saprolings at a time doesn’t meet my needs in Commander. Sidar Kondo fans are shouting at the screen right now telling me about instant combat tricks that can pump Tana above 2/2 after blocks are declared (specifically, blocks that do not include blocking a 2/2 Tana thanks to Sidar Kondo). Hey, I can use those combat tricks too on a 7/7 trampling Tana that has already been buffed by additional methods to get even more damage and Saprolings. The Tana/Sidar Kondo path limits those additional methods, because adding a single point of power to Tana at any time before blocks are declared makes Sidar Kondo obsolete as an enabler for Tana’s attack. While a purely combat trick approach could work and you might like it, I want something else. A quick check on Tana’s current EDHREC page shows something interesting. Jungle Shrine is in 55% of the Tana decks out there. Since adding white is the most popular thing that people are doing, I’m not going to do that. Now how do we use EDHREC.com, which aggregates the most popular things that people are doing, to help build a non-white Tana deck? 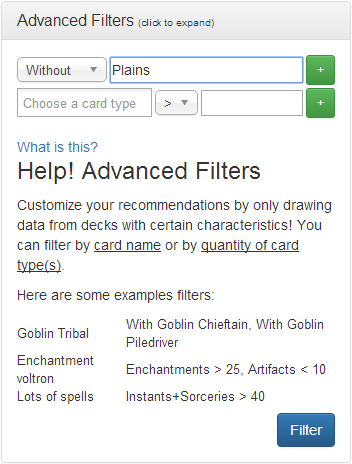 Below Tana’s card image is a line that says “Advanced Filters (click to expand)”. Click it. It will expand. Change “With” to “Without”, type “Plains”, and click the blue button that says “Filter”. This gives us a more specific set of results that does not look at decks with Plains in them. Out of the Signature cards from the 53 decks at this time, there are a few red/green dual lands. While those are certainly good choices for the deck, seeing multiple usual suspect lands in the Signature Cards section shows that we don’t have much consensus in Tana’s data yet for a variety of cards with strong synergy. For utility lands, Kessig Wolf Run could pull the aforementioned Sidar Kondo combat trick approach but it would also work for any Tana build. Oran-Rief, the Vastwood works for a deck that plans on making a lot of green creatures at the same time. There is a strong general theme of cards that do well if you have a lot of creatures, such as Cryptolith Rite, Purphoros, God of the Forge, and Beastmaster Ascension. If you like the idea of composting your Saprolings into the circle of life, there are a few examples of creatures with Devour such as Mycoloth and Bloodspore Thrinax. To assemble my arboreal army, Tana has to get some combat damage through to another player. 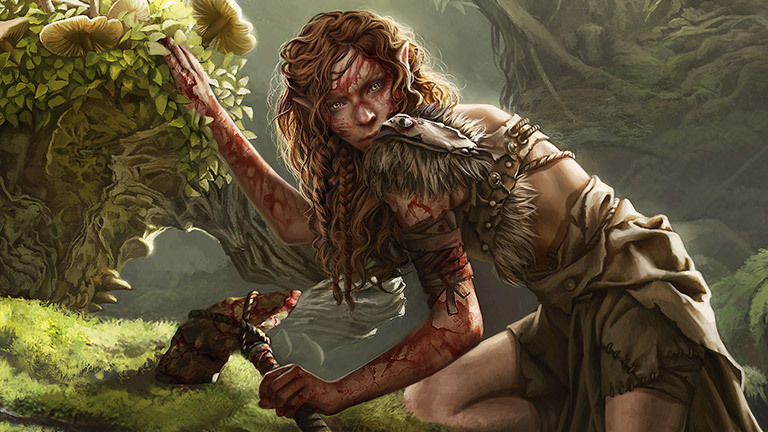 A Gatherer search can show us other commanders who also need to do that, and then EDHREC can show us what cards those commanders use to make it happen. Suppose we don’t have time to look at each of those 40 commanders in the search results. To narrow it further, let’s add the constraint that the commander does not have white in their color identity. Also, since I’ve written two articles in a row that use blue, let’s make the seemingly arbitrary decision not to use blue this time. The flying legends here don’t face the same combat challenge that Tana does. Drana would be a strong addition to buff our wave of weenies, especially in a Reyhan build. If we are going with Reyhan, then Skullbriar’s page shows us more +1/+1 counter tricks like Increasing Savagery. Skullbriar has briar in the name, so it’s kind of a plant, right? Let’s try a search for commanders in our colors that make any kind of creature token. When searching, we put “creature token” in quotes so that it searches for those words together. Otherwise, we get extraneous results like King Macar, the Gold-Cursed which exiles a creature and makes a gold artifact token, but does not make a creature token. Of these, I think Prossh has the most in common with my plan for Tana so I’ll use Prossh to find good Jund cards that I might have missed. Hey look, a Sprouting Thrinax. Thanks, Prossh! Next time: Silas Renn, Seeker Adept!